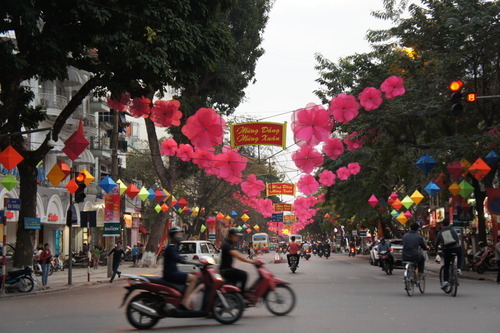 Vietnamese New Year, Tết, is Vietnam’s biggest and most important holiday, and Hanoi is all decked out for the occasion. 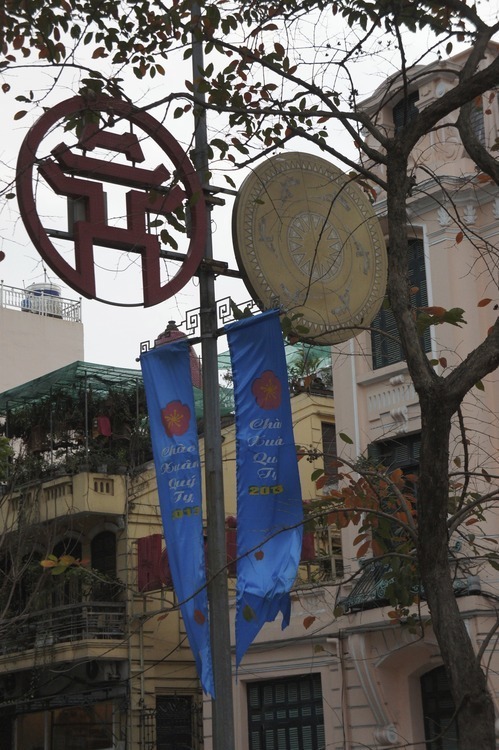 The one on the left is the symbol of Hanoi. 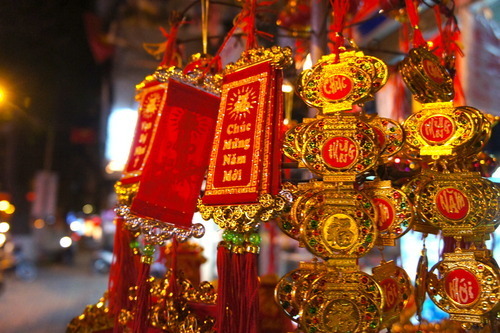 The timing of the holiday is based off of the Lunar Calendar, and as you may know, each year has an animal representing it. This year’s animal is the snake. 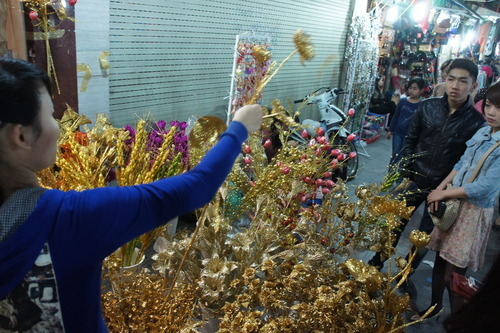 In the days leading up to Tết, people were busy buying new clothes, trees for the occasion and offerings either to burn or put on the family’s altar. 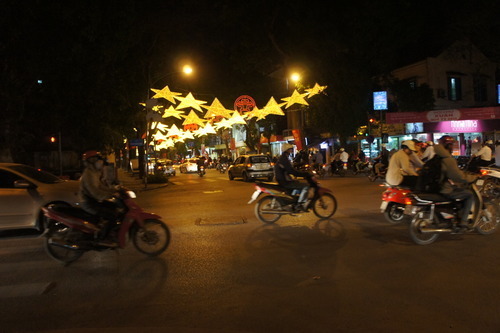 I was lucky enough to be invited to spend Tết with my friend Hien and her family. 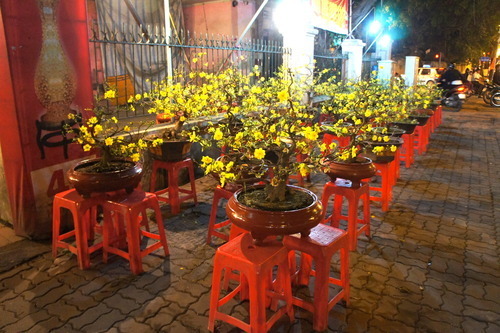 New Year’s Eve was spent watching comedy/commentary of all that had happened in Vietnam in the past year, stuffing lucky envelopes, “lì xì”with money to give as gifts and preparing the altar tables for various gods and ancestors, as well as one for Buddha. 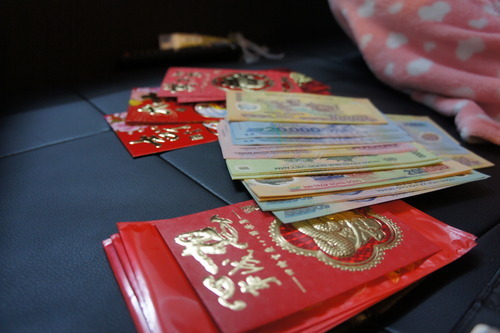 The money in the envelopes should be new, and some colors are more lucky than others. Red is considered a very lucky color. 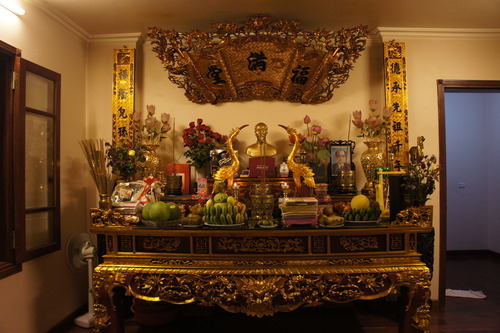 This is the altar for ancestors. 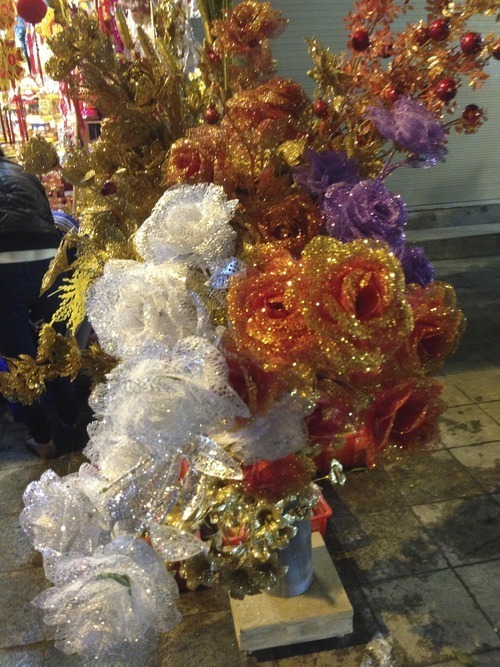 The offerings include fruits, paper money, sweets, beer, cola and cigarettes among other things. 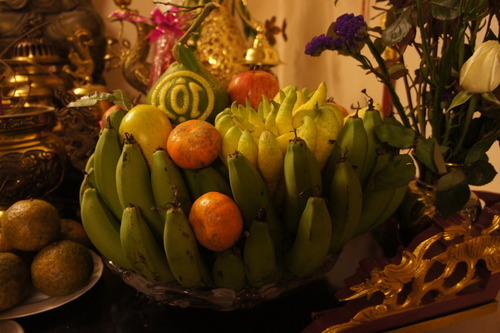 One important part of the altar is”Mâm Ngũ Quả”, or “five fruits”. 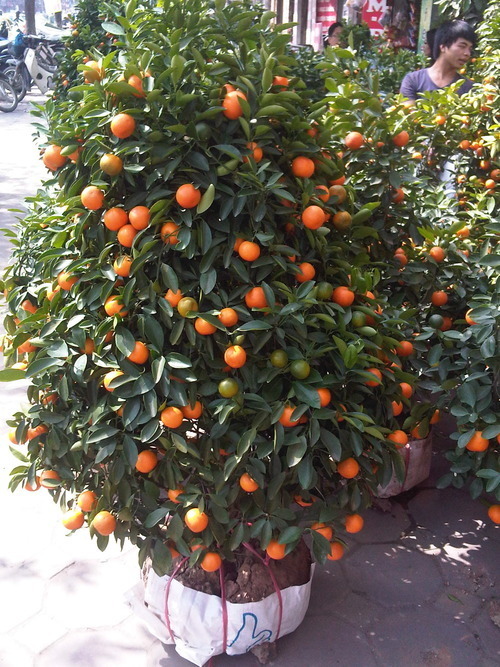 Even numbers are unlucky so it’s important that there is an odd number of fruits; this odd number rule applies to everything placed on the altar. To the left is “bánh chung”, which is made up of rice, mung beans and pork and wrapped in banana leaves. You can read about how it’s made here. 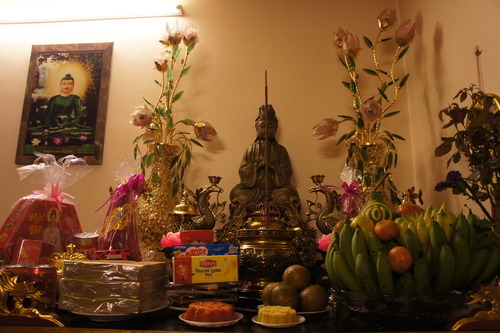 The altar for Buddha. There is no meat or alcohol on this altar. 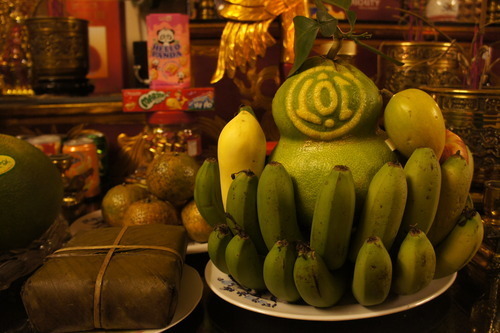 Mâm Ngũ Quả with Buddha’s hand fruit. 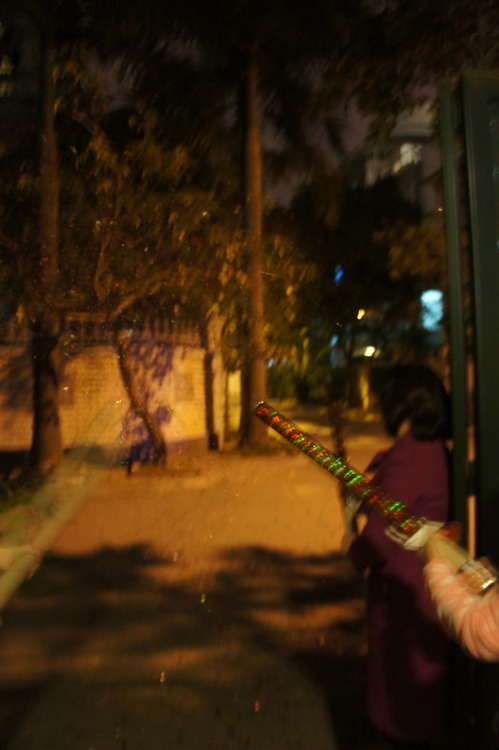 At midnight, we passed out the xì lì and shot off some fireworks filled with confetti. 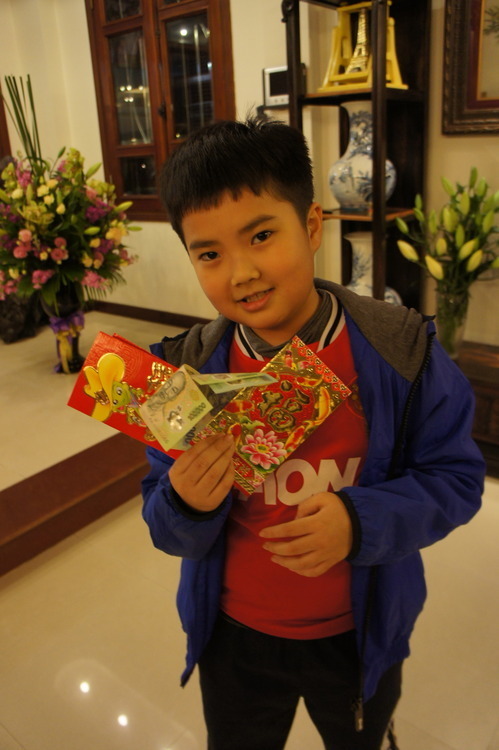 Khanh with his lucky money. All in all it was a great night, filled with lots of fun and many interesting experiences. If you made it all the way through this very long post, then congratulations! 🙂 I’ll be sharing other great Tết experiences soon, including New Year’s Day, so make sure you check back!